Whether we like or not, Christmas is approaching! This past week I worked hard on trying to have everything done in school and it's finally time to think about few things I could wish for Christmas. 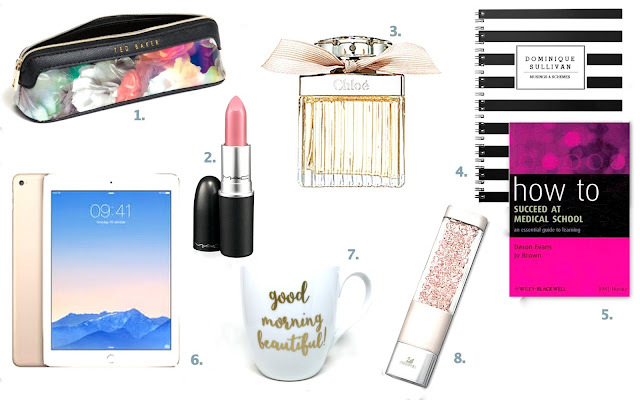 And now I can finally share with you a list of few lovely items I would love to have in my life in 2016! (as probably a lot of bloggers or medical students also do, hehe). 1. This Ted Baker blooming pencil case is absolutely stunning! I am addicted to my stationary collection, I always use so many colored pencils, pens and highlighters for studying and such a beautiful floral print could definitely brighten up my day. 2. My obsession with this MAC Please me lipstick has begun about one and half years ago. I discovered it while reading some beauty blogs and now I could not imagine one day without it. This color is the most flattering on me (at least I hope so:)). 3. My perfume? It's this one. Chloé by Chloé. Roses and peony, suitable for day and night. My like of this scent can never turn to dislike. Dear Santa, remember that please! 4. I found this perfect black and white customizable notebook and I think that it is a great way to have fun while writing your notes in lectures. Don't you think the same? 5. Christmas is definitely a season for books! There are several I want to read. I love reading motivational books, which are great anytime I need some motivation. I would love to get this small one, which could inspire me and maybe help to find a new way how to succeed at my school. 6. I am researching into iPads for a while. I am thinking about buying one because it seems like a good complement for studying (and blogging, of course:)). I have to say that carrying around my MacBook is not always the most convenient thing. And when I saw this golden iPad Air 2, I totally fell in love with it. Such a beautiful color and design! 7. This mug has been on my wish list since the last year. I think that it is such a great reminder while you are having your morning coffee. 8. A sparkling memory stick? Oh yes, please! This Swarovski USB key is a must-have: so beautiful, practical and stylish.